When it came to selecting a roofing system for the new Little Owls Nursery in Armadale, Scotland, a solution was required that could meet the aesthetic and performance criteria - and crucially, help meet the project’s tight build schedule. Here, Building Products looks at how the latest addition to Catnic’s building components portfolio helped the construction team to meet the project’s multiple requirements. For any project, there are a number of factors to take into account when it comes to the specification of a roofing solution. The roof is integral to a building’s overall aesthetic yet at the same time, the products chosen need to meet a plethora of performance, legislative and sustainability objectives. This was certainly the case for the Little Owls Nursery. Located on South Street, in Armadale, West Lothian. Due to open in the late summer of 2015, the nursery will be able to cater for up to 100 children between the ages of 0-5 years old. Designed by 99 Design Architects and built by Balgownie Scotland Ltd, the roof for the building features three different levels of pitched roofing and a solution was required that could combine high performance, ease of installation and a modern, aesthetic appeal. The Little Owls Nursery had originally been designed with an aluminium roof, however this proved too expensive and it was up to McDonald Roofing to source an appropriate solution that would offer the highest levels of quality and performance, within budget. 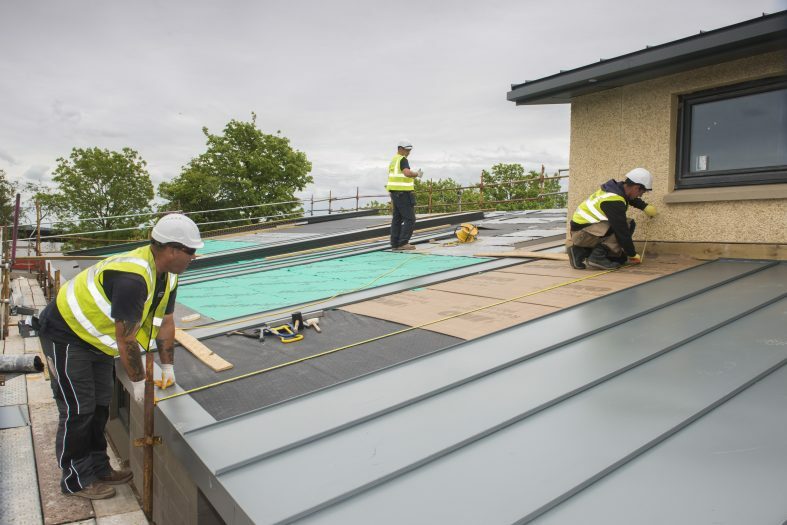 After being introduced to the product by Burton Roofing Merchants, the construction team specified the new SSR2 Standing Seam Roofing and Cladding system. “We always use Catnic for lintels and when this new roofing system was shown to us by our local merchant we knew it was the perfect solution for The Little Owls Nursery. In addition to its aesthetic advantages, the product’s technical credentials also impressed,” explained Stewart McDonald, Director of McDonald Roofing. In fact, the team from McDonald Roofing installed the system in just three weeks, helping to maintain the project’s tight build schedule. The SSR2 panels are approximately seven times lighter than traditional roof tiles, which results in less handling and therefore a significantly reduced fixing time – helping to save time on site. Crucially, the panels still provide a durable solution that can last in excess of 40 years with BBA Certification. In addition, the system has been manufactured to meet all relevant legislation, including load bearing for wind speed in accordance with EN 1991-4 and weather tightness in accordance with BS 5534 Parts 1 and 2. Furthermore, the SSR2 system offered the team at Little Owls an easy approach to detailing with external and internal gutters, matching fascia and soffits and a range of eight colours to select from. Sourcing products that can help to meet the aesthetic requirements of a build is vital – yet specifiers still need to take into account that the environmental credentials of roofing products are high on the agenda for many clients. The added advantage of the SSR2 system is that it is a BRE Green Guide ‘A Rated’ product, which helps to maximise the potential of obtaining credits under the Responsible Sourcing of Materials section of BREEAM and at end of life – the panels are 100% recyclable. When it comes to roofing – construction and project teams will always face the challenge of making the design a working reality. This means achieving all the necessary aesthetic, performance, legislative and eco credentials possible, while factoring in the need for a product that can be installed quickly and effectively. For the Little Owls Nursery in Scotland – the new SSR2 Standing Seam Roofing and Cladding system was an ideal solution that allowed the team to achieve just that. The new SSR2 Standing Seam Roofing and Cladding system is suitable for conventional residential and commercial pitched roofing, and provides a wealth of performance and aesthetic advantages.